Do you want to sail around the world on a rocking ship and meet some really strange creatures? Embark on 1429 Uncharted Seas slot and feel like Christopher Columbus or Vasco da Gama for a day! Placed in 15th century, the age of Renaissance and great quests, this slot released by Thunderkick in 2014 takes you on a miraculous journey with plenty of winning opportunities. By the way, this is one of the best online slots in terms of RTP you can find. It’s actually offers such high payouts that some casinos set special wagering terms on this game. 1429 Uncharted Seas game features five reels and 25 fixed paylines, with bet value ranging from $0.01 to $100, which can be easily selected clicking on the bet button. It is considered the be one of the loosest slots online with the theoretical return to player of 98.6%. Autoplay feature is next to the Spin button. Designed to look like a part of an ancient map, regular symbols are the Sun, the Moon and the stars. Besides, there are exclusive symbols featuring mystical creatures such as a mermaid or a huge octopus and lobster jiggling ships. Five mermaid symbols at the highest stake bring you 5,000 coins. Wild symbol is a Ship symbol which appears on reels 2, 3 and 4. It is not an ordinary ship, though. When included on a winning payline, pushed up from the water by a monster, it expands throughout the reel providing you with a chance of a real big win. It substitutes all the symbols except the Bonus. The Compass symbol is Scatter. When tree of these land anywhere on your reels, a bonus feature of at least 10 free spins is unlocked. 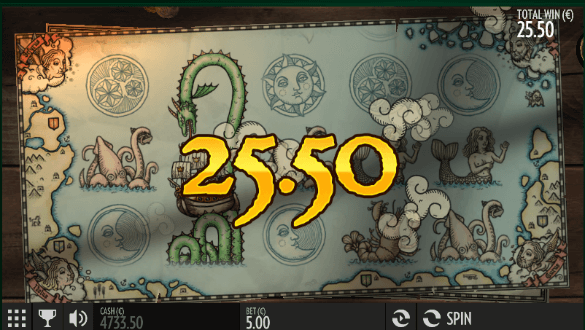 The more Compass symbols you acquire, the more free spins you will receive, with 50 being the maximum. Dark ambience sound effects mixed with those announcing the potential win and refined graphics and animation as seen in other games by Thunderkick makes this journey a thrilling experience. When Wild symbols start expanding some really pleasant surprises occur. So, all aboard and don’t miss this exploration!